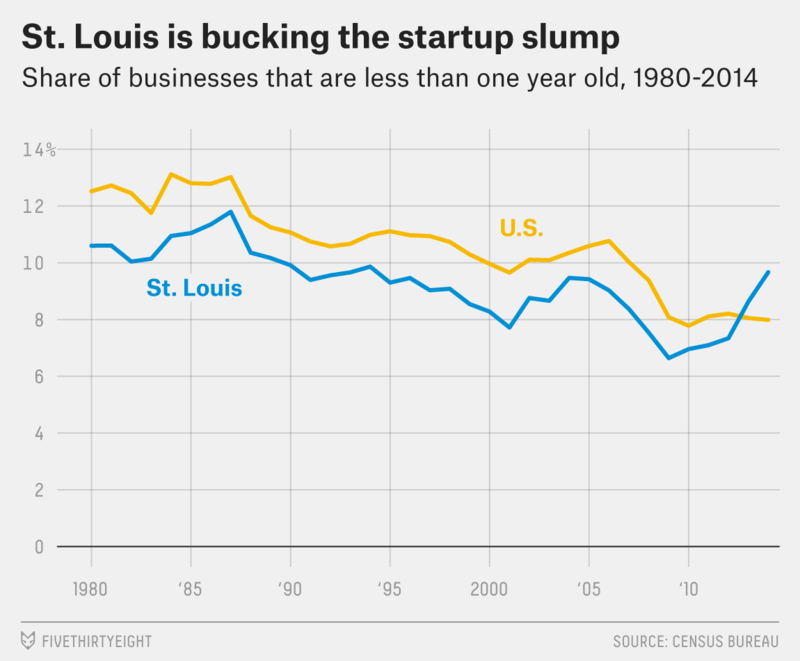 In 2013, when I was a reporter for The Wall Street Journal, I flew to St. Louis to learn about the city’s budding startup scene. The city, like the rest of the U.S., was stuck in a decades-long entrepreneurial slump that had left its economy dependent on a handful of big, staid corporations — corporations that were pulling up stakes to head overseas at a rate that alarmed local leaders. (The city’s iconic brewer, Anheuser-Busch, had been sold to a Belgian conglomerate five years earlier.) But an informal coalition of local business leaders, wealthy investors and ambitious 20-somethings were trying to spark an entrepreneurial revival in the Arch City. They had launched a fund to invest in local ventures, created entrepreneurship clubs at local universities, and converted part of a massive downtown office building into an unlikely startup hub. On the one hand, it isn’t surprising to see Missouri making progress. Both the state’s public and private sectors have been unusually aggressive in promoting entrepreneurship. The state has its own investment fund, the Missouri Technology Corporation, which invests in local businesses; the fund, together with newly formed private investment groups, have helped the state emerge as a regional leader in startup financing. The Kauffman Foundation — a prominent nonprofit that researches and promotes entrepreneurship — is based in Kansas City. Our knowledge is improving, however. Earlier this month, the Census Bureau, in a joint effort with the Kauffman Foundation, released the first Annual Survey of Entrepreneurs, which provides new information on America’s businesses and the people who found them. The report’s most valuable insights will come in future years, as trends become clear, but even the first year’s data contains interesting nuggets. For example, by far the largest share of new businesses in Missouri — nearly a third — are in health care, an area the state has actively promoted. Also interesting: Women own a higher share of startups in Missouri than in any other state. That could be a hint that one way to help turn America’s entrepreneurial slump around is to help more women to start businesses. “What we’re seeing is a lot more gender and ethnic diversity in our newer businesses than we had in our older businesses,” Secretary of Commerce Penny Pritzker, herself a former entrepreneur, said in an interview. “This is the kind of information that is really vital for policymakers.��� Armed with better data, perhaps leaders in both the public and private sectors will at last crack the code for promoting entrepreneurship — and reverse the startup slump in the process. Hiring is up and unemployment is down, but as of 2014, Americans still weren’t making any more money: Median household income has been essentially flat since the recession ended in 2009. This week, we’ll learn whether 2015 was the year that finally began to change. On Tuesday, the Census Bureau will release its annual report on income and poverty in the U.S. and the individual states.